“It’s better to know some of the questions than all of the Answers” James Thurber (1894-1961) Author. Every day we go about our business in and around the world, we witness activities going on around us, the more enlightened of us know too, not only observe but to question what is going on. Children grow up asking questions. The better their questions the more challenging and important the answers we give them. Questions embody a child’s creativity they serve as an aid to learning and cause others to reflect on the meaning of things. It’s as we grow up as adults that we lose the questioning ability that really is vital to creating understanding. It’s a fact that the quality of your life will be determined by the questions that you ask? 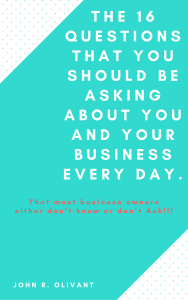 So in this short E’book, we are going to look at the 16 questions that you should be asking yourself every day. It’s a fact that the quality of your life will be determined by the questions you ask?